In the 5th century AD the Roman Empire, on the brink of collapse, withdrew its armies from Britain to defend the remnants of the Empire elsewhere. This was followed by a period of intense migration across Europe– the Völkerwanderung – where Germanic tribes - including the Goths, Vandals, Angles and Saxons - roamed across the continent . Left undefended, the British Isles were ripe for invasion and saw several waves of settlers from north Germany and Scandinavia . The Germanic tribes who settled in Britain during this period are known as the Anglo-Saxons. The Anglo-Saxons reached the eastern coast of Britain between 400 AD and 650 AD; they travelled inland along Roman roads, settling in large numbers amongst the inhabitants of the country [3, 1, 4]. 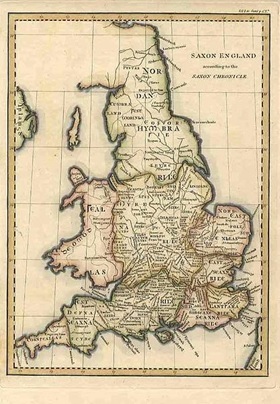 These new arrivals gave their name to the country: Land of the Angles, or in Old English, ‘Engla land’. As well as language, the Anglo-Saxons brought with them new culture and politics; Britain was divided into seven tribal political units – clans or kingdoms – based on extended kin groups and each was ruled by a different king. Strikingly the genetic structure of the British population today mirrors that of the Anglo-Saxon tribal settlements in the 5th to 7th centuries AD [5, 6]. The clans would often fight amongst each other but were ultimately forced to unite in the face of escalating raids from Danes and Viking invaders. Although Christianity had been introduced to Britain during Roman rule, Anglo-Saxon religion was predominantly pagan - based on Germanic mythology . This all changed in the late 6th century when St Augustine, sent by the Roman Catholic Church, succeeded in converting King Æthelberht to Christianity, which rapidly caught on all across England . Conversion brought with it membership into the powerful institution of European Christendom; providing political and economic rewards . Trade with continental – and especially Christian – Europe flourished and the Anglo-Saxons traded metals, agricultural produce, cloth and slaves . Old-English, the language spoken by Anglo-Saxons, has a distinctive legacy in present-day England. The pagan gods have lent their names to the weekdays –Tuesday from Tiw (god of war), Wednesday from Woden (god of the dead) and Thursday from Thor (god of thunder) . Geographically, suffixes such as –ham and –ton, which would have denoted a village or farmstead, remain widespread in the British countryside . Old English poetry and literary epics, such as Beowolf, are widely read and attest to the importance on loyalty, bravery and strength in Anglo-Saxon society . As well as language and literature, Anglo-Saxon culture can be glimpsed in archaeological remains: buildings, cemeteries and burial sites. It is widely believed that Anglo-Saxon burials were community affairs, involving kinship groups, extended family, children and slaves . The South and East of Britain are peppered with graves of men, women and children from this period. 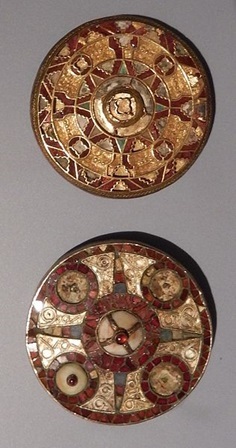 Anglo-Saxons were often buried alongside grave goods: weapons such as swords, spears and shields, treasured jewellery such as brooches, combs and beads, bits of pottery, bones and even some artefacts from the Roman Period (43 AD – 410 AD) [4, 7]. A few kilometres from Cambridge, in the east of England, UK, lies the village of Oakington; recorded in the Doomsday Book of 1086 AD as Hochinton . While evidence of ancient burials in Oakington was first uncovered in 1926, it wasn’t until 1994 that archaeological excavation of the site began. Twenty years later, by 2014, over 120 individuals had been unearthed: Anglo-Saxon men, women, and a large number of children [4, 7]. One unique finding was the skeleton of a pregnant woman in her late twenties, who was buried with her hand placed over her abdomen, and so much jewellery that she was nicknamed ‘Queeny’ by the archaeology students who found her . We have ancient DNA samples from four women buried in Oakington who would have lived in the 5th of 6th century AD . One woman was in her mid 40s; standing around 5’3 she had native British ancestry – probably a descendent of Iron Age Britons. The grave goods that surrounded her suggest that she was wealthy: a cruciform brooch, amber, blue and silver glass beads, a strap-end knife and an iron buckle . In contrast the graves of the other women were less well adorned with few or no items (although one woman was buried with a small copper disc that may have been a Roman coin). The lack of grave goods accompanying the two individuals who were genetically ‘foreign’ could suggest that immigrants, in general, were poorer than the indigenous people . Aside from the women with Iron Age ancestry the other three show mixed or non-British heritage: their clear genetic affinity with Dutch and Danish populations suggest that they, or some of their recent ancestors, were Anglo-Saxon immigrants. The mixed genetic signal of one woman – with both ancient British and foreign relatives – shows that, contrary to some beliefs, the Anglo-Saxon immigrants did not simple settle in Britain, but they integrated and interbred with the locals . 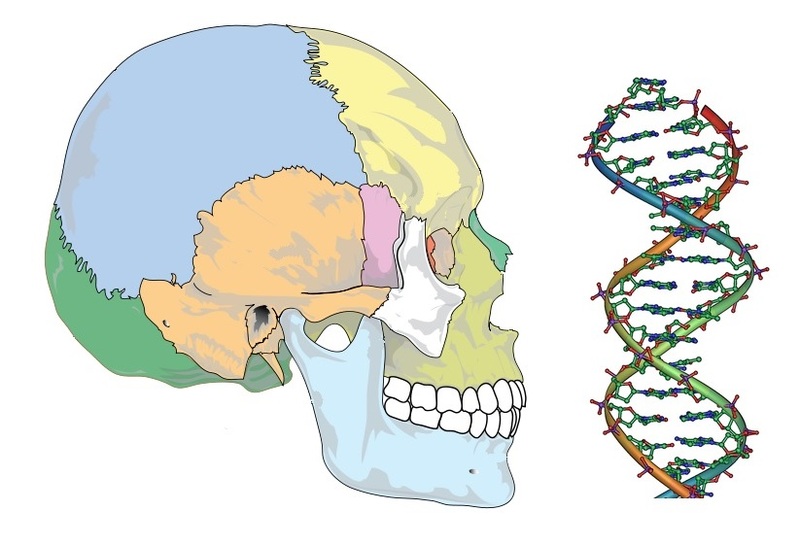 When all of these ancient DNA samples are compared to contemporary populations another striking pattern is revealed: the current population of England derive between 25 and 40% of their ancestry from Anglo-Saxon migrations . As well as their DNA, the skeletons of these Anglo-Saxon women can help paint us a picture of life in 5th century Oakington. For instance, the teeth of all the individuals show similar deformities that would have arisen from food scarcity, infection or disease during childhood . Interestingly these four skeletons, as well as many others buried at the site, are bent in awkward positions – as though neither graves nor corpses were measured prior to inhumation or bodies were prepared at a separate site then transported to graves and fit in as well as possible . The proximity to each other of the many finds at Oakington, as well as the large number of young individuals, has led archaeologists to suggest that this site may have been home to an enclosed Saxon community of which these four women were a part . Martz, T. 2011. The Adoption of Christianity by the Irish and Anglo-Saxons: The Creation of Two Different Christian Societies. Colonial Academic Alliance Undergraduate Research Journal. Vol 2, Article 1. Dennison, E. 1992. A63 Melton Grade Separated Junction Archaeological Desk-Top Survey. Volume 1: Factual Report. Planning, Transport and Environment. Topf, A. L., Gilbert, M. T. P., Dumbacher, J. P. & Hoelzel, A. R. Tracing the phylogeography of human populations in Britain based on 4th-11th century mtDNA genotypes. Mol. Biol. Evol. 23, 152–161 (2006). Hilts, C. 2011. Oakington: Life and death in the East Anglian Fens. Current Archaeology. Vol, 261.